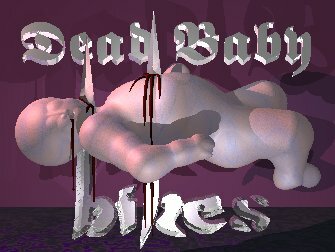 Dead Baby Bikes is a shop dedicated to timely, kindly repair of people-propelled vehicles. It is a warm place to have a cup of tea amidst the ever-present Seattle downpour. We provide all kinds of expert bicycle repair, adjustment, replacement, and fine tuning, as well as being dedicated to the inspired design and manufacture of crazy bikes. Lately the doors open most infrequently, and we regret its absence from the community. It has decided to become more of an underground operation. You will find it only if you search. Easier to find will be the CounterBalance. You are visitor # to the ongoing madness. Currently, like eight or nine choppers fill the stable, as well as Tallbike-001, with a 6+-foot seat height, the double-small (aka T-002, our latte-painted dual 20-inch frame cycle-yes, even the twisted succumb to the horrible coffee influence), T-003/Shwinnivega, a trike conversion, a Schwinn trike-ceratops, and a pair of unicycles that no one dares ride. We've had a Pixie and a Pixie II Stingray, but the wheels were kind of leaky and ancient. And then those Green Apple Quickstep peckers took them back. Just like that. After we shined them and made 'em all pretty. We have ridden upwards of 15 wide on multiple occaisions, with near a dozen on certified crazy bikes. One inspiration to our quest was the venerable CHUNK 666, they've got a spanking-keen website you should check out. Our chums in Boston were so cool as to link to us, they go by the acronym of SCUL. That's Chopper #3, the Turd Scout, so named for the initial test ride event of catching an alley bum pants-down next to the dumpster who as he pinched his loaf free mumbled "That's some bike!!" 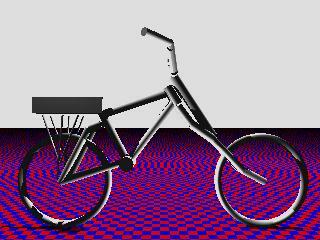 When I slap the tape measure on all the bikes I'll get nice computer models of them too, but fer now that'll hafta do. Peek inside our bay door sometime, 2318 1/2 2nd Avenue, Seattle. In the alley. Only virtual babies were harmed to produce this page, we like real babies. We have an ill-organized yet extremely sucessful race at the beginning of August each year. Participants are assuredly elated by the frenzy. Wowza, 3 years running. Show me the pictures, guys, lots of 'em. 3 megs worth. More coming, too. Click the spinning camera, endure the downloads. The stories are wacky but the art's purty. The ongoing nonsense telling you about the bicycle jesus. I can reveal the secret fruits of late-night animation binges. And you can get to the "newer" website from there. So click. These are some nice buttons I made, my "personal" links below, home, me, 3D graphics and my crappy links. Click above for Dead Baby stuff.